Eduardo Mello of Opcode Games has recently started taking pre-orders for his upcoming Super Game Module (SGM). The SGM is a small device that plugs into the ColecoVision expansion port and increases the console RAM memory and sound capabilities. With the SGM you can run especially designed games that offer more complex gameplay than ever before. And of course arcade ports that play just like the real thing. Comes with professionally printed box, manual and catalogs. Packaging mimics the classic ColecoVision packaging design circa 1982/83, so it will match your ColecoVision collection nicely. The price for the Super Game Module is $90 including shipping in the US ($95 to Canada and $100 elsewhere). Eduardo is presently aiming to ship the SGM in December 2012. For more details about the SGM including how to pre-order one, please visit our ColecoVision / Adam Forum. Several former Atari employees comprising Actual Entertainment are developing an all-new game titled Gubble 3D based around the long-lost art of arcade maze games. The designer of the classic Crystal Castles arcade game, Franz Lanzinger, is among those involved, and anyone familiar with Crystal Castles will feel right at home in Gubble 3D. Other designers participating include Eric Ginner, Mark Robichek, Steve Woita, Susan Woita, Karl Anderson, Dave Ralston, Paul Barton and Seppo "Zep" Hurme. Gubble 3D is itself based on an earlier game called Gubble. Gubble 3D will use a 3D engine and will introduce new tools, weapons, and entirely new gameplay mechanics. You can learn more about the project on Kickstarter, where the team hope to raise enough money to fund development. Included on the Kickstarter page is a video narrated by Franz Lanzinger, along with a detailed description of the game and what the team hopes to accomplish. Pre-Order Atari 2600 Boulder Dash® Now! We're proud to announce that Boulder Dash® for the Atari 2600 is now available for pre-ordering! Andrew Davie and Thomas Jentzsch have been working on this Atari 2600 port of Boulder Dash® for almost a decade. Together these two Atari 2600 veterans have used their insight and sophisticated knowledge about the Atari console to bring to life a faithful rendering of the classic, action-puzzle game (first released on the Atari 8-bit computer platform in 1984) from First Star Software, Inc. Game-play, sounds, and graphics have been faithfully reproduced, culminating in a game for the Atari 2600 unlike any previously seen. With the full cooperation of First Star Software, Inc., this title will finally be available on the 2600! AtariAge and First Star Software, Inc. recently held a box and label design competition for Boulder Dash®, and the winning entry was crafted by André Bolfing. André's artwork will appear on the cartridge, manual and box (slight adjustments will be made before publishing). Boulder Dash® includes the game cartridge (running on a special version of our Melody Board) and professionally printed manual and box. The box includes an insert that keeps the cartridge in place and helps protect the box from being crushed. Only 250 copies are available to purchase, so make sure to buy your copy today! In order to be fair to everyone who wants to buy a copy of Boulder Dash®, we are limiting sales of the game to one per customer at this time. Boulder Dash® will ship once production (currently underway) is complete, in early 2012. Boulder Dash® Label Design Contest! AtariAge and First Star Software, Inc. are hosting a box and label design competition for the recently announced Boulder Dash® Atari 2600 port (see detailed news item below)! The winning design will be featured on the game cartridge, the manual, and the box. Plans are to release the AtariAge version of Boulder Dash® in time for Christmas. Now you can be a part of the effort to bring about this highly anticipated release! The winner of the contest will receive a copy of Boulder Dash® in cartridge form with box and manual, featuring their winning label design, signed by Andrew, Thomas, Albert, and Richard M. Spitalny (president of First Star Software, Inc.) The winner will also receive a $50 gift certificate in the AtariAge Store. The contest will run until 11:59pm (CST), Sunday, November 27th, 2011 and all submissions must be received by this time! After the contest has ended, AtariAge, First Star Software, Thomas Jentzsch and Andrew Davie will select one of the entries as the label to be used for Boulder Dash®. Full details about how to enter the contest are here! You can follow the contest in our Contests Forum. Good luck, and we look forward to seeing your entries! On Oct 26, 2011, Duane Alan Hahn (Random Terrain) finished his first Atari 2600 batari Basic homebrew game called Seaweed Assault. It is an arcade port of a game that never was but should have been. This sci-fi horror arcade shooter is addictive and challenging. Duane Alan Hahn designed Seaweed Assault to use controlled randomness to add replay value and after you try it you will be coming back for more and more. "Your name is Captain Nalad Modnar and you are part of an advanced underwater civilization. It's your duty to patrol your section of the ocean in a semi-organic submarine called the Manatee. Highly aggressive seaweed surrounds you and it keeps trying to replicate faster than you can shoot. Use your torpedoes to blast any bits of seaweed that appear before they clog up your sector and spread to others, making it nearly impossible for anyone to travel. Don't let the seaweed strangle your civilization to extinction." The .bin file and online manual can be found here. Try it out. You won't regret it. AtariAge user Stan has put together a special offer for AtariAge members! Stan runs a record label called Mind Flare Media and his next release is an album by an artist called Army of 2600. 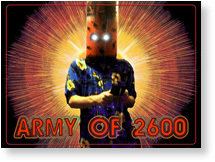 Army of 2600 is an awesome mix of experimental and dance-type music made primarily from Atari 2600 sounds. His first, full-length album is titled Return of the Bloop Beep Buzz and will be officially available for sale by the third week of December. The album consists of 12 different tracks (no remixes) running over 40 minutes. Stan has put together a special promotion to allow AtariAge members to purchase the CD early at a reduced price, bundled together with an Army of 2600 t-shirt. For this promotion, you will be receiving the regular retail glass-mastered CD at half price for $5. In addition, you will be receiving a high-quality, silkscreened t-shirt printed on black, ultra cotton tees using the color image you see at the top of this thread (based on the album's actual artwork). The total for this offer is only $20 including shipping for those in the United States. This shirt will ONLY be available for this special promotion, and thus, other than close friends and family of the band, non-AtariAge members will have no access to it. After the preorder phase is over and the order is processed, this shirt will no longer be in production. For complete details about this offer, a sample track from the album, and how you can participate, please drop by our Marketplace Forum. Following the recent release of their amazing Boulder Dash® playable demo, programmers Andrew Davie and Thomas Jentzsch, in association with publishers AtariAge and First Star Software, Inc, are very excited to announce that the original game in the Boulder Dash® series, Boulder Dash® Volume 1, will be available for purchase, exclusively from the AtariAge Store, in time for Christmas 2011! Andrew Davie and Thomas Jentzsch have been working on this Atari 2600 port of Boulder Dash® for almost a decade. Together these two Atari 2600 veterans have used their insight and sophisticated knowledge about the Atari console to bring to life a faithful rendering of the classic, action-puzzle game (first released on the Atari 8-bit computer platform in 1984) from First Star Software, Inc. Game-play, sounds, and graphics have been faithfully reproduced, culminating in a game for the Atari 2600 unlike any previously seen. With the full cooperation of First Star Software, Inc., this title will finally be available on the 2600! The game features exact implementations of all 16 caves and 4 intermissions of the original game, playable with 5 levels of difficulty, providing over 80 unique levels of challenging fun. The physics, sound, and graphics are as exact as possible on the Atari 2600, and the game-play and timing are exactly the same as in the original version of the game. In short, this is a not-to-be-missed masterpiece, available in a limited run of only 250 copies. AtariAge and First Star Software, Inc. will be hosting a box and label design competition! Winners will receive a copy of the game signed by Andrew, Thomas, Albert, and Richard M. Spitalny (president of First Star Software, Inc.) . Keep watching AtariAge for announcements of the competition! The game will be available only as a cartridge (with professionally printed box and manual) in time for Christmas 2011, with a purchase price of $75 USD. To ensure you receive a copy and to keep tabs on the release of Boulder Dash® for the 2600, please follow our Atari 2600 Forum! You can learn more and purchase Retrocade Magazine over at Stone Age Gamer. "The Candy Catch event at your Halloween Block Party has just begun. Armed with only your trusty pumpkin bucket, you'll need to catch as much candy as you can in the hopes of ensuring neighborhood bragging rights (and some cavities!) But beware of the wind-up robot toys zipping across the sidewalks. Get hit by one, and you're eliminated!" Grant is now taking pre-orders for both the Limited Text Label version costing only $20 shipped in the US and for the Cartridge, Manual and Box version featuring label and box artwork created by Brian Ostrowski, Brian O on our forums, for only $35 shipped in the US. For more information about ordering please visit the Candy Catcher Pre-Order thread in our Marketplace Forum. Version 2.0 of GUIntv has been released. GUIntv is a graphical frontend for the Mac version of jzintv. It runs alongside jzintv and provides standard controls like buttons and menus that every Mac user is familiar with. After some initial setup, GUIntv will launch and configure jzintv automatically. Just click and play.? Jzintv is a Mattel Intellivision emulator by Joe Zbiciak that lets you play classic Intellivision games from the ‘70s and ‘80s on a modern computer. Originally written for Linux, jzintv has been ported to many other systems including Apple's OS X. Although Jzintv is the best Intellivision emulator for OS X, it is still basically a Unix application, and until now, the only way to use it has been to type commands in the Terminal. Because jzintv is so "un-Mac like", it is inconvenient for many users, and often difficult for newcomers to get started with. The current version of GUIntv requires OS X 10.6 and higher, but the original Applescript version will work with older versions of OS X and Power PC systems. Your Mom Was Wrong! - Playing Video Games IS Healthy For You! You can read these articles and more inside the Retrogaming Times Monthly, now running 168 months in a row! You can also browse the RTM archives to catch up on past issues. The 2011 Portland Retro Gaming Expo will be held on the weekend of September 24-25, 2011 at the Doubletree Hotel in Portland, Oregon. 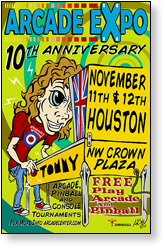 This year's show features a new venue that will allow more space this year for vendors, arcade games and speakers! The PRGE organizers are very excited to announce that their main speakers this year will include David Crane, Garry Kitchen and Tod Frye. David Crane is one of the most successful designers of entertainment software in the world. He co-founded Activision and programmed many of the finest videogames of the time. Some of the many mega-hit games he has designed include Pitfall, Pitfall II, Dragster, Fishing Derby, Laser Blast, Freeway, Grand Prix, Ghostbusters, and A Boy and His Blob(NES). Garry Kitchen was a leading pioneer in the videogame industry with a career in interactive entertainment spanning over 30 years. Some of his most notable early works in the videogame industry include programming the 2600 port of Donkey Kong and making Keystone Kapers, which was nominated for videogame of the year in 1983. Tod Frye started as a video game programmer in the classic Atari 2600 days. He produced several games with some never being released. Tod Frye is most remembered for programming Pac-Man for the Atari 2600. Here is your chance to meet and talk to these great programmers and much more at the Portland Retro Gaming Expo. You can discuss the show in our Events Forum with PRGE staff and AtariAge members.